Not ready for the cloud? Talk to sales about JustFood on-premises. 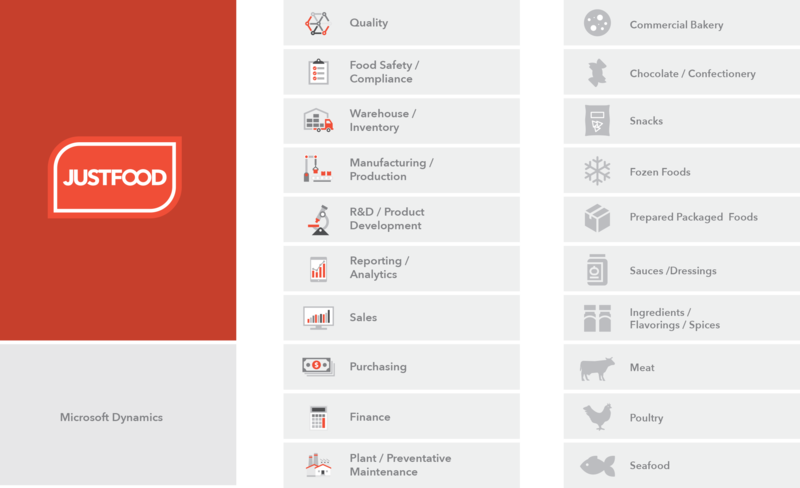 JustFood ERP software is made up of hundreds of modules built to meet the specific needs of food manufacturers and distributors. We make it easy to port over your existing sales, finance, manufacturing, warehouse and safety processes into JustFood. JustFood ERP business software has been built for companies in food manufacturing and distribution. This means modules, features and functionality that food companies need in order to grow their business, operate efficiently and comply with safety requirements. Bring your processes and procedures online with JustFood’s custom, food specific modules. Integrate your quality, safety, warehouse and any other food process into the system so that you are able to track progress, inform the next stage of production and ensure quality and consistency. JustFood ERP software is built with features and functionalities that are geared toward food companies across all sectors and industries. Because every sector has different pain points and unique requirements, we’ve ensured that our software can address them all.